I hope you had a wonderful Thanksgiving! This recipe is one that we had to cut from my cookbook due to space constraints, but it’s too good to keep from you. It was inspired by two delicious experiences with polenta, or grits, if you’d rather. They’re basically the same thing. The first was a polenta bowl at a farm-to-table restaurant in Omaha called Kitchen Table. My bowl looked pretty similar to what you see here, but with a poached egg. The second was at my cousin’s wedding shower, where I found grits generously swirled with cheddar cheese, green chilis and melted butter. This combination is a homemade version of Kitchen Table’s bowl with Southwestern influences inspired by my cousin’s grits. I cooked the polenta with bell pepper and stirred in some salsa verde to amp up the flavor. Then I stirred in just one tablespoon of butter and folded in crumbled goat cheese, making the polenta ultra creamy. 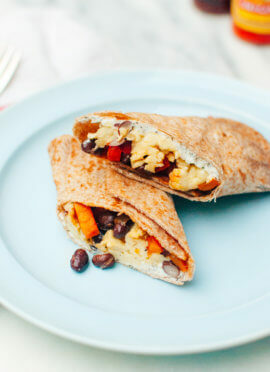 This is a versatile recipe that you can adjust to work with any vegetables in your drawer. I roasted my vegetables for maximum flavor, but you could choose to steam or sauté them instead. 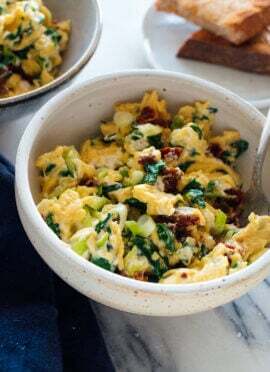 You can also play around with the cheese (cheddar or Parmesan would be great), and you can prepare your eggs however you’d like. Lightly sautéed greens would be nice, too. 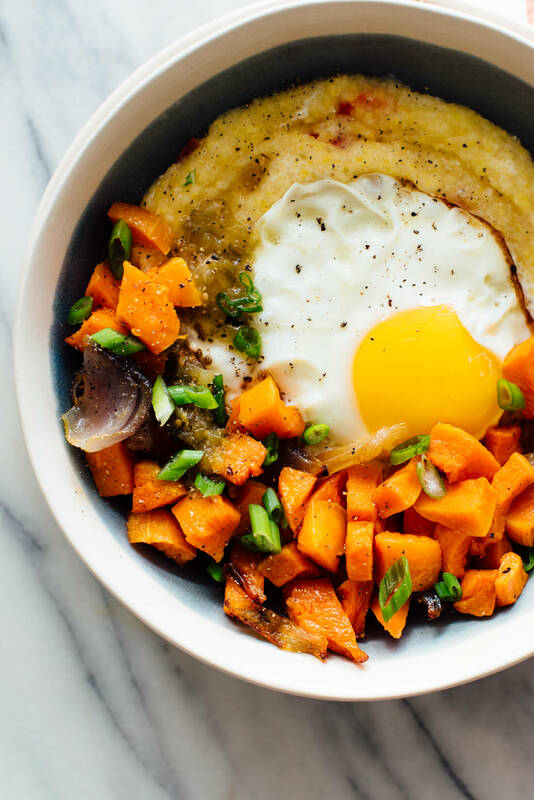 You’ll probably find a few different options for polenta/grits at the grocery store; some have unnecessary additives and some take longer to cook. I recommend using Bob’s Red Mill’s polenta since it worked great for me and doesn’t contain any extraneous ingredients. Another suggestion? Polenta is at its creamy best when served fresh, so this is not the best option for leftovers. Please let me know how you make your bowls in the comments! 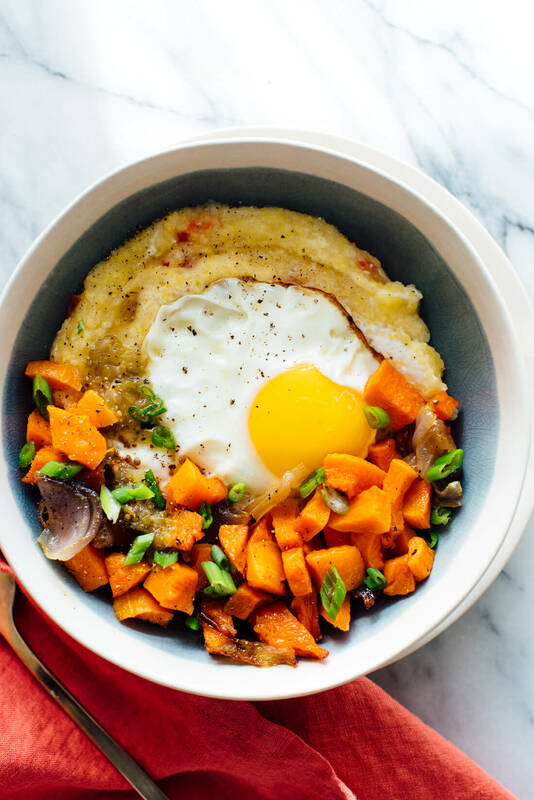 Creamy goat cheese polenta topped with a fried egg and roasted vegetables. 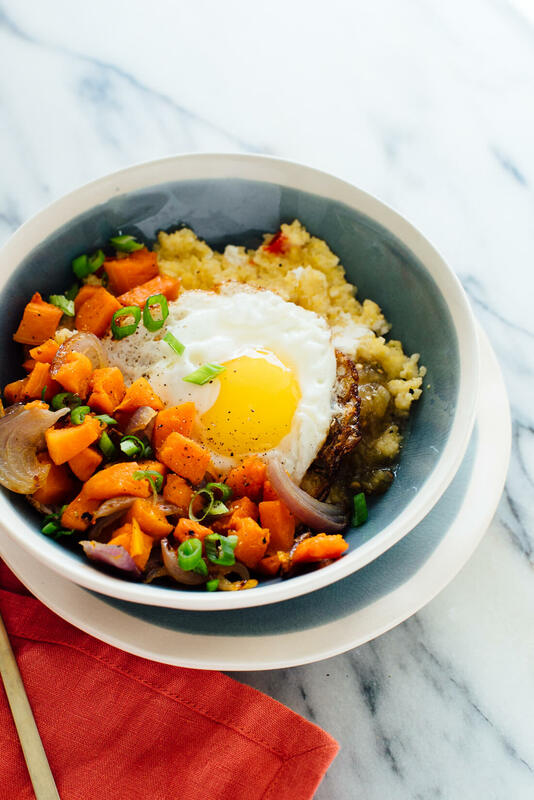 This is a delicious, brunch-worthy recipe that you can serve for dinner, too! Recipe yields 4 servings (you might have some leftover roasted vegetables). To roast the vegetables: Preheat the oven to 400°F. On a large, rimmed baking sheet, combine the vegetables with 2 tablespoons olive oil and a sprinkle of salt and pepper. Toss until they are lightly coated in oil, then arrange the vegetables in a single layer across the pan. Bake for 25 to 40 minutes (timing will depend on your choice of vegetables), tossing halfway, until the vegetables are tender and deeply golden on the edges. To cook the polenta: In a medium saucepan, warm 2 teaspoons olive oil over medium heat until shimmering. Add the chopped bell pepper and ½ teaspoon salt. Cook, stirring occasionally, until the pepper is tender, about 5 minutes. Add the amount of water specified on your package of polenta, crank up the heat and bring the mixture to a boil. Pour in the polenta, whisk to combine, and reduce heat to medium-low. Cook until thickened, which can take as little as 5 minutes depending on your polenta, whisking often to remove any clumps. Remove the pot from the heat, and stir in the butter, salsa verde and freshly ground black pepper, to taste. Add additional salt, if necessary. Gently fold in the crumbled goat cheese, just until combined. Cover and set aside. Cook your eggs as desired. Divide the grits and eggs into 4 bowls. Divide the vegetables into the bowls and finish them with a light sprinkle of green onion. Serve with additional salsa verde and/or hot sauce on the side. Make it gluten free: Be sure to use certified gluten-free grits. Make it dairy free/vegan: You could replace the goat cheese with vegan sour cream (see my cookbook, page 217) and omit the butter, or stir in a teaspoon or two of olive oil in its place. For a vegan meal, omit the egg. 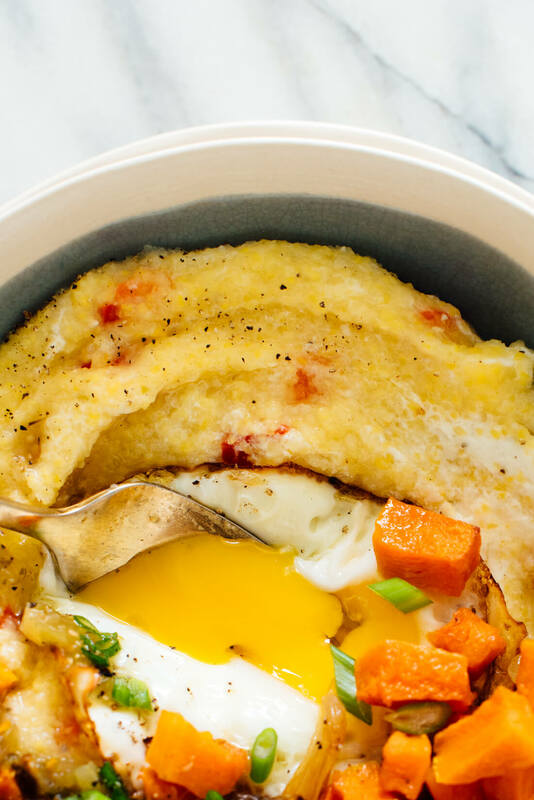 *Polenta note: I use and recommend Bob’s Red Mill brand of corn polenta/grits (affiliate link), because they are free of additives and cook in just 5 minutes. **How to fry eggs in olive oil: See this post. OK yes, this is exactly the kind of meal I need on a weeknight in the winter. Cozy, cheesy and with an egg on top. Love this! 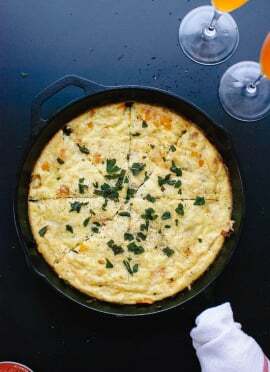 Definitely looks like a meal worthy of brunch or “breakfast for dinner.” Can’t wait to try it out! I have found polenta to be delicious cooked with coconut milk and coconut oil. Sometimes I also stir corn kernels into the polenta for extra sweetness and a nice texture contrast. Mix of colors is just great. Looks so healthly and delicious. I order a bowl from you. Oh, yes please!!!! This is definitely one to try asap! Thanks, Kate! leftover polenta is GREAT formed into small patties & fried in a little bacon grease! dip in gravy or top with hot homemade applesauce, or make them tot-size & throw em on a salad like croutons! This looks amazing! I can’t wait to try it. Also Alton Brown has a recipe for grits that calls for milk and always turns out great. I wonder if that would work here too. I made this for dinner last night and it was delicious! Even without the egg on top it was very satisfying. My husband’s second helping was bigger than the first. Thank you for another great recipe. I’m a big fan. You are welcome, Terry! I am glad both you and your husband enjoyed it. Made a variation with what was on hand. Used cheddar, scallions & organic spicy salsa,in place of goat cheese, red pepper and salsa verde. I omitted the grilled veggies. Even so, the polenta was delicious and the egg on top definitely added to the flavor. The color from the red salsa and scallions looked great. Will definitely make again. Can’t wait to try it with the veggies, red pepper and goat cheese. I added this to my meal plan as soon as I saw it. Perfect nourishing comfort food for an autumn evening! My 3 year old loves polenta so I was excited to see an adaptation with some veg cooked in with the grains– added some leftover, mashed baked sweet potato in with the pepper and that worked well. I freaking LOVE this kind of recipe! I was looking at a bare fridge and pantry and this recipe resulted in a crazy delicious meal! I didn’t have eggs, but I had brussel sprouts, sweet potatoes, kale, goat cheese and one of those tubes of polenta I had no clue what to do with (I haven’t cooked with it before, so I didn’t really get what I was buying). I roasted a sweet potato and some brussel sprouts and sauteed some kale on the stovetop. The contrast in textures and flavors was sooo good! I’m not great at meal planning so I love customizable meals like this :). I love to hear that, Charlotte! I am glad this recipe was able to help you use the ingredients you had in your fridge. I really appreciate your comment and review! 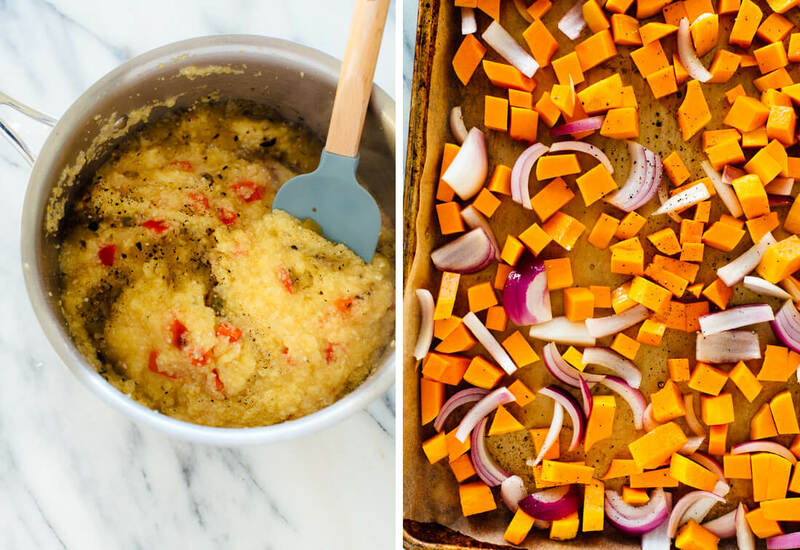 I’ve recently become so obsessed with polenta—where has it been all my life?! Can’t wait to try this one! Let me know what you think, Lorie! I made this last week for dinner and hands down it is probably one of the best meals I’ve ever made/eaten! I loved all the flavors. The veggies I roasted were bell peppers, carrots, asparagus, brussels sprouts and red onion. My husband was a huge fan too. I’m definitely adding this to my rotation. Hooray! I love that, Kayla. Thanks for your review! I think I’m going to make this tomorrow! It looks so delicious and I can’t wait to try it! Let me know what you think, Curtis! This looks so delicious! I’m making it for myself and my wife tonight! It was delicious! I burnt the vegetables because I left them in the oven too long. Question I have for you: how did you put so many vegetables on your cookie sheet? I tried to put the variety of vegetables you suggested- butternut squash, brussels sprouts, onion & sweet potato- but I couldn’t fit all of them on the largest sheet I have. 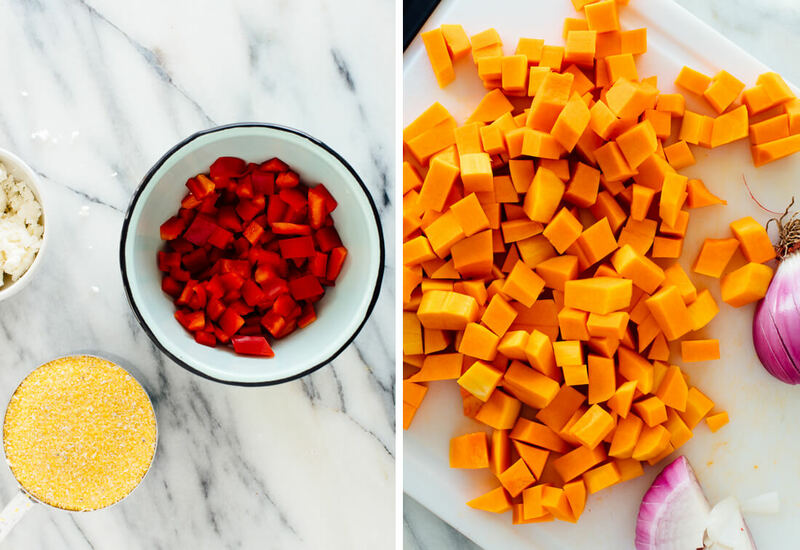 Do you have a butternut squash soup recipe? This was fantastic! Absolutely loved the flavours, I made the sweet potato and cheddar version and will definitely be making this again. Thank you Kate for providing us with such wholesome and flavourful recipes time and time again! Love it, Samantha! Thank you, for your review and comment. Loved this. The goat cheese/red pepper polenta was delicious! My husband ate some of the leftovers of it the next day for breakfast with a poached egg. We made it with roasted Brussels sprouts, butternut squash and red onion, and it was a great and filling meal. What a great way to have some left overs! Thank you, Marny for sharing your variation and for review. This was wonderful!! I ended up using 4 ounces of goat cheese because I love it and that was how much I purchased. Turned out great. Wonderful! Thank you, Ann for sharing. Let me know what you think, Jerry! Thanks for the comment! I am absolutely in LOVE with your recipes! I made this last night (with yellow grits instead of polenta). It is difficult to find dry polenta in the South in regular grocery stores. But WOW! I think I will ALWAYS put goat cheese and salsa verde in my grits from now on! We used roasted butternut squash and brussels sprouts and some sautéed spinach. It was DEVINE! I ate the leftover grits for breakfast. YUMMY! This was delicious! I made it with the intention of taking it to work for lunch this week, so I omitted the egg. Used Brussels sprouts, cremini mushrooms, and carrots as my veggies. I cooked the polenta in vegetable broth for extra flavor and used a red salsa instead of green (and doubled the amount). It was pretty filling for lunch and will last me 3 additional meals. Thanks for a great, inexpensive recipe! Thanks for sharing your variation, Sneha! I appreciate the review.